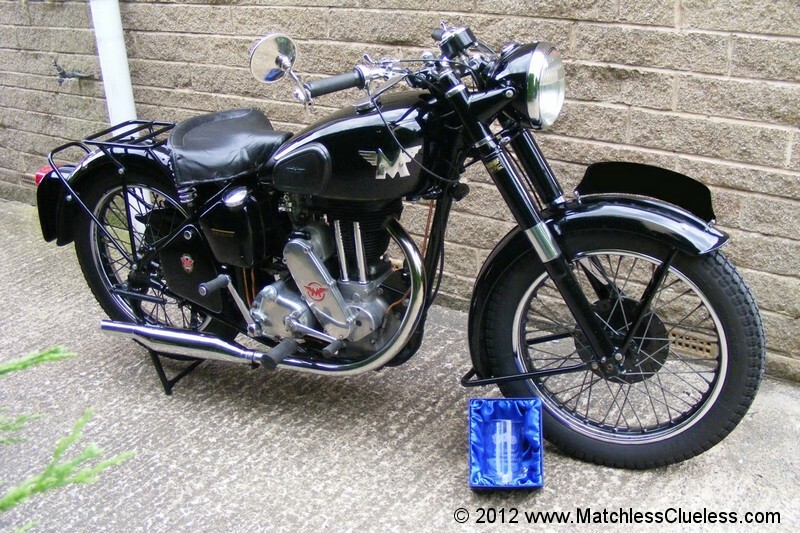 My original 1951 Matchless G3LS motorcycle has recently been joined by a 1949 Matchless G3L rigid model. I had admired this new bike for a while since the previous owner posted some photos on the AJS and Matchless Owners Club website. As you can see by the photo’s shown on this page, it is a pretty attractive looking machine – nice and black and shiny in all the right places! It has also won prizes in the past too, so I can’t be the only one who thinks it looks good. 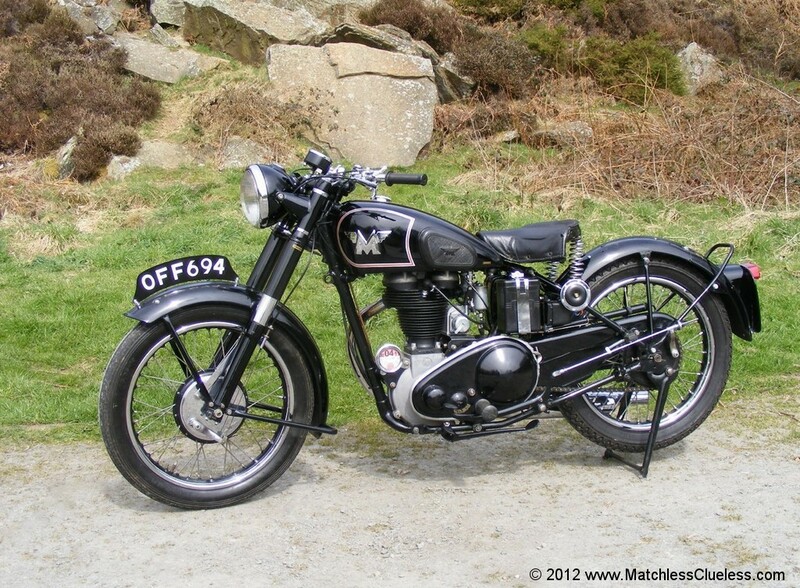 Although only two years older (1949) than my other Matchless (1951) it is quite a different machine in many respects. Technically the main difference is that it is a G3L rigid model with no rear suspension whereas my other bike is a G3LS model which has ‘jampot’ rear suspension, so called because of the looks of the damper units. It also has a single saddle-type seat fitted so no pillion, whereas my G3LS has a long bench-type seat for two-up riding. So I’m looking forward to seeing how the two bikes compare in terms of comfort and handling with these subtle differences. However the main difference is really the looks of the two bikes. This G3L is a nice shiny black and looks pretty much as it would have when it first left the factory more than six decades ago. This is in stark contrast to the aged and battle-worn look of my first bike which still sports the remnants of its original Indian Army khaki green paintwork. The bike also has quite an interesting history which the previous owner spent a great deal of effort researching, so I am indebted to him for that. I don’t have the details to hand at the moment, but I’ll try to update this page with more information as soon as I get chance. The bike isn’t currently on the road though as it is halfway through a full restoration and therefore mostly packaged safely away in boxes back in the UK waiting for me to come back from Hong Kong. The majority of the hard work, painting and replacement of parts has been completed so it’s now just a case of putting it all back together. So that’s something to look forward too! I have added a gallery of photo’s of the bike which you can view here. There aren’t so many pictures of the complete bike at the moment due to it still be mid-restoration and in boxes, but I will be adding more photo updates as the bike slowly comes back together. 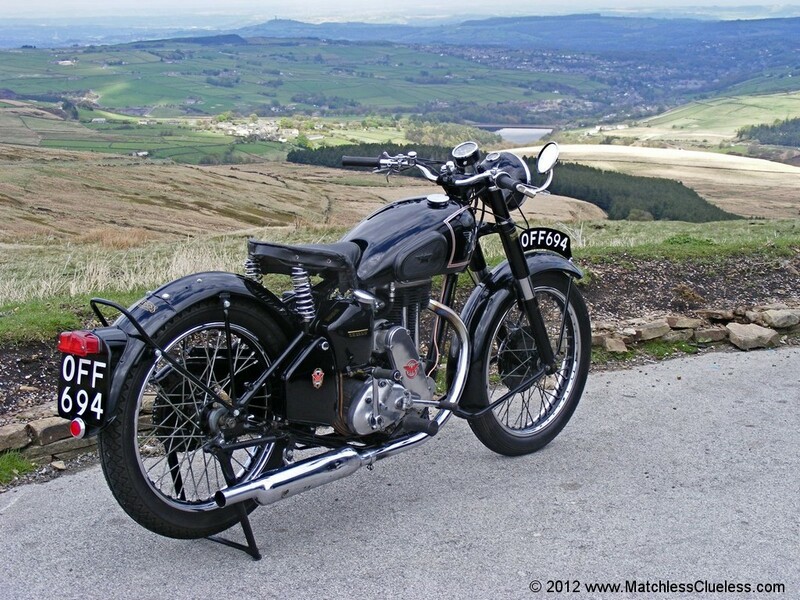 Credit to the great photo’s of the bike in the stunning scenery of the Yorkshire moors goes to the previous owner. Thanks Dave! Difficult to see why it needed restoring from this picture – maybe it was just good cosmetically and not so good mechanically ? My ’49 G80 rigid is not anything like as tidy ! Yep, I know what you mean. Looks pretty tidy in the photos doesn’t it. I think it was previously restored about 8 years ago so there wasn’t a lot wrong, but the previous owner decided to take it from good to excellent condition. A big contrast to my Indian G3LS isn’t it. Most of the hard work has already been done thankfully, so it’s mostly a case of reassembly now although that will be on hold for a while until I’m next back in the UK. A nice job to look forward to though! hey i have an 1949 matchless 500cc bike half way through restoring it i would love it if you could please email me some photos of your 49 matchless so i can get the finner details 100% right , please help me out and email me. I have a 1949 matchless G80. It has candle wick refillable rear shocks. The Jampots don’t fit the frame and is noted as the only year they were fitted as they were a total failure. Good for dating your machine? We are very Proud to give our Matchless to You. You are a very good example. Nice site! I’m in teh States and am building a 1941 G3L from scratch. That being I was given 2 motors. I found wheels and a frame which is within 20 numbers of a mates in UK. Recently, original fenders arrived. Since I needed a clutch which is a bit expensive, I found that a Honda 350 clutch will graft onto a CP gearbox shaft with a little creative wire EDM burning of the clutch basket. Cheap and bullet proof. I am also making specialist tools for these great bikes. What is difference between Berman garebox and AMC garebox. Hi Naghial. They’re just different types of gearbox made by different manufacturers. From memory, the Burman gearbox was used on Matchless G3 models until about 1951 after which the AMC box took over. (My ’51 G3LS has a Burman ‘box with a later clutch so is a sort of intermediate model). They look quite different and are pretty simple to tell apart. I guess the later AMC gearbox is of a more modern design. I have g3l model 1949 350CC I want to know that which carburetor is for this machine. Hi. I have g3l model 1949 350CC I want to know that which carburetor is for this machine. 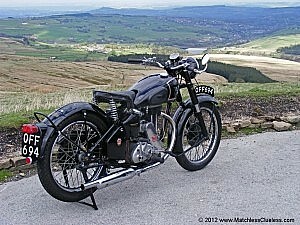 I have a matchless g3l 350cc model 1949 let me know that which number bearing use in said motorcycles’s clutch. I am looking to buy an original 1949 to 1951 Matchless G3L with Candlestick rear suspension. All numbers correct etc. I would be delighted to hear of one for sale. sir,you have asked about a g3l and asking about rear suspension,as there is no rear suspension for g3l. Hi Y. V. Roa,Thank you for your comment. The 1949 – 1951 period saw many combinations of frame and suspension units. Some were rigid rear end which went on to 1952. Some G3l models had a frame conversion with Candlestick rear suspension and then in 1952 the Jampot rear suspension appeared. Many years ago I owned an original 1949 G3L with Candlestick rear suspension. Hence the search for a similar model. Frame and suspension combinations differed widely during this period depending where the bikes were built. Russell Motorcycles in Clapham used to assemble batches of machines for the factory. This period also saw several changes to the machines, including the Alloy Cylinder Head. It’s ok MR Jones,but my vechile has no rear suspension but only seat springs.And you know the one with with the springs is the older one. hiee all there,i think all of you are the proud owners of matchless g3l,are you running your vechicle,right?so what i say is i am ready to manufacture wet clutch plates which are dipped in oil,which icreases the life of clutch plates and increases the pick-up.you people can call to me in search of order-9849196305,9032369682.i am y.v.rao from hyderabad,i am also a heavenly owner of my 1946 matchless g3l.thamk you.